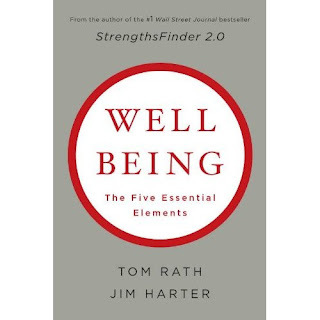 In Well Being: The Five Essential Elements, authors Tom Rath and Jim Harter coalesce the data on what makes for a good life. From myriad studies and surveys polling populations in the U.S. and in many other nations, their best work is in summarizing how people are finding happiness in the areas of career, social, physical, financial, and community well-being. 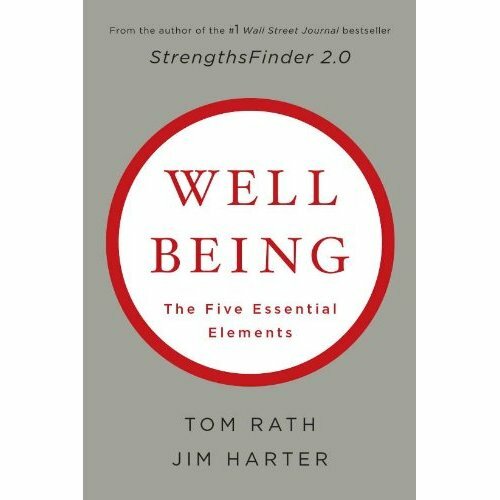 Published by Gallup, it's typical self-help in that the focus is limited to whatever changes the individual can muster in order to move toward greater well-being. You would expect this when we are taking about health, job, money, and social life. Thus, I was a little surprised, when the book takes up the topic of community well being, even then it was all about my involvement in it, not justice or common wealth or harmony or shalom. It was more about how my altruism in civic, even church affairs, can raise my own sense of feeling good. But isn't altruism a little more than my feeling good about myself? There is some drop off from other books in this vein, such as Now, Discover Your Strengths, and How Full Is Your Bucket? ; Rath has co-authored the later as well. Like these, Well Being provides a helpful online instrument called a "Wellbeing Finder," which can be used multiple times to note your progress in well being through time. There is also a daily resource to journal how the small changes you're choosing are improving your well being. Because so much in this book we have either heard before, or just makes good sense, it may be easy to miss the research that is truly helpful. In career well-being, I appreciated the emphasis on using a personal strength every day and finding a person at work who encourages your growth. In matters of health, I learned that even 20 minutes of exercise can boost your mood for up to 12 hours. In the area of finances, the theme is all about NOT buying not goods and services, but rather, providing experiences-lasting memories- for yourself and others. The social aspect of well being was interesting. Researchers have found that, not only our friend's happiness boosts our own, but a friend's friend's happiness does too. Even your friend's friend's friend's level of happiness has an improved positive effect (+6%) on our happiness, compared with an increase of $10,000 in income (+2%)! The authors advise to get six hours of social time per day (including online and emails), and spend more time with friends, people you enjoy. The books drives home the idea of setting certain "defaults" for ourselves that will equip us to make healthy choices. In the area of nutrition, researchers found that in order to eat a healthy meal while dining out, go to an eatery that has many, many healthy choices. Why? Because when fast -food drive-ins offer their one healthy choice, people almost never choose them but opt for the burger and fries. When you go to the grocery store, stock up on all healthy choices. Automated deductions from your pay check for savings and tax payments are financial defaults we can make to live under our means. When choosing an exercise or diet regimen, the chances of success are multiplied when "positive peer pressure" is the default. The book's appeal? To those who find the subject of well-being itself interesting, you will learn from how the good, solid data is presented. However, the well-being for the sake of well-being theme is tiring and tedious. Human wholeness and healing does not exist in the vacuum of facts and statistics from Harvard studies, and is not founded on entirely individualistic categories. In a world of so much social upheaval and suffering, this book falls short. It just doesn't help me with what I need most: transcending my own world to see, and even embrace, with healthy and holy compassion, the pain of others.